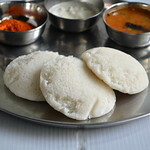 Usually I make Vendhaya keerai kootu, vendhaya keerai sambar or methi pulao for lunch. 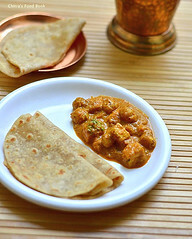 If its for dinner, I make Vendhaya keerai chapathi i.e methi leaves paratha ( thepla). 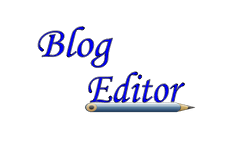 Recently when I was looking for some vendhaya keerai kuzhambu varieties, I came across this Kara kulambu in this blog. It was quite interesting just like our vatha kuzhambu. 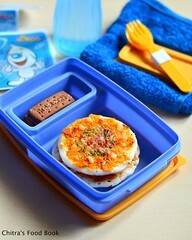 So I tried it for our lunch. 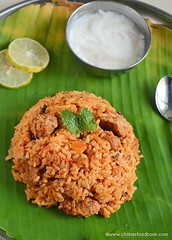 We loved it a lot and enjoyed it mixing with plain rice. 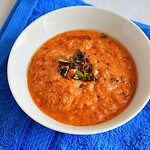 I was happy to learn yet another yummy, healthy gravy recipe using methi leaves. I am sure I will make it often in my kitchen. 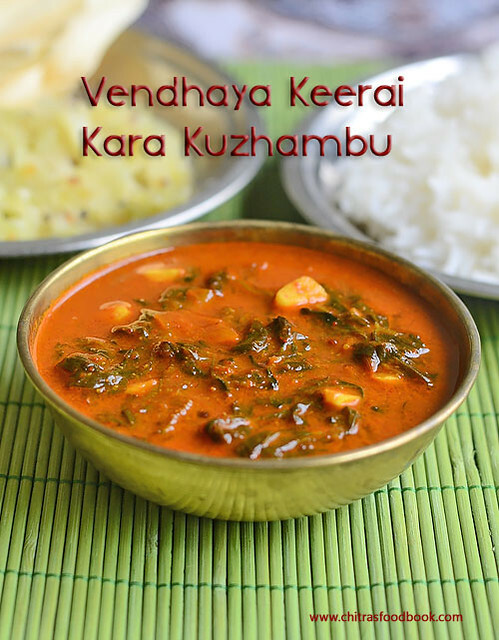 Do try this easy, no grinding vendhaya keerai kuzhambu for your lunch and reap its health benefits. You will love it like us. 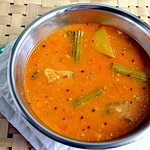 Ok, Lets see how to make vendhaya keerai kara kuzhambu with step by step pictures ! Soak tamarind in hot water for 10 minutes and take the extract using 2 cups of water. 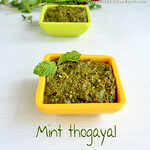 Keep it apart.Take the methi leaves, wash it well and set aside. Wash and chop the tomato, onion, garlic and curry leaves. Slit the green chilli. Heat oil in a kadai and splutter mustard seeds, cumin, urad dal.Saute the onion, green chillies, garlic cloves and curry leaves. Now add the tomato pieces and saute till mushy. Now add the methi leaves and saute till it shrinks in quantity. To this, add red chilli powder, turmeric powder, dhania powder and required salt. Mix well in low flame without burning the spice powders. 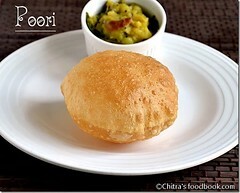 Add the tamarind extract , jaggery and boil the gravy till thickens and oil starts to float on top. Check for taste and add more red chilli powder or salt if needed. Boil for few more minutes. Remove and serve hot with rice.. Adjust the quantity of red chilli powder and green chillies as per your taste. Do not reduce the quantity of tamarind. Gravy may taste bitter. 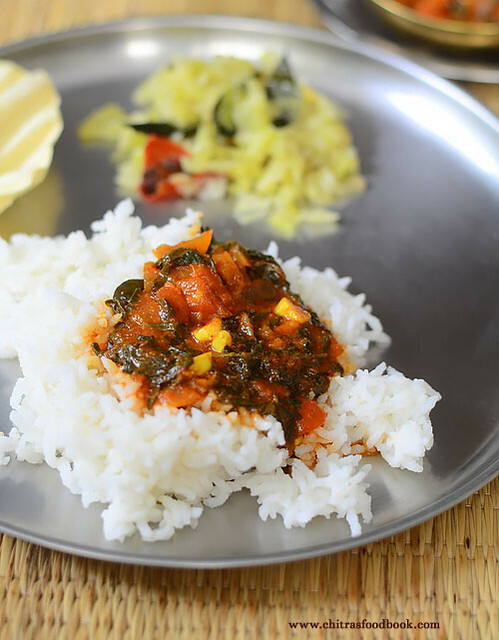 You should saute the methi leaves well to reduce its bitterness completely. 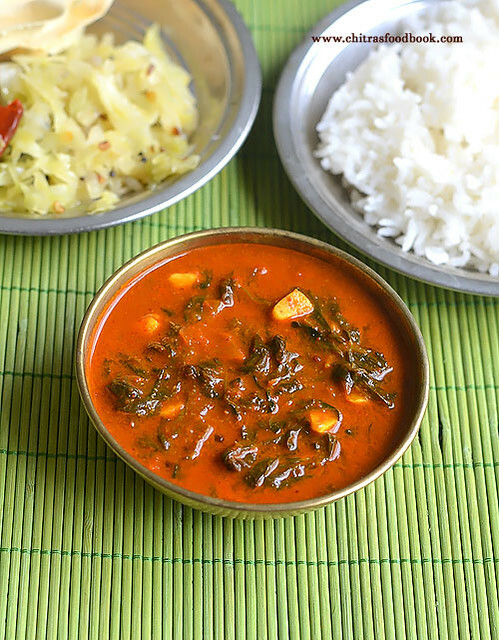 Try this easy, healthy methi leaves gravy at home for rice. 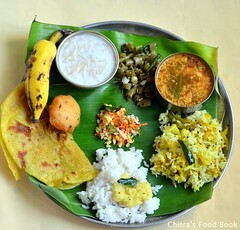 Enjoy with any kootu or poriyal along with papad. Tastes yum !